What Happens When Most Facebook Friends are Dead? It’s bound to happen someday, maybe not to you but at least to someone – where Facebook becomes more of an online graveyard then a place to hang out and post funny photos etc. All of my facebook friends that have died still have accounts which have become kind of like tombstones that still have photos and memories of the deceased and one way comments. 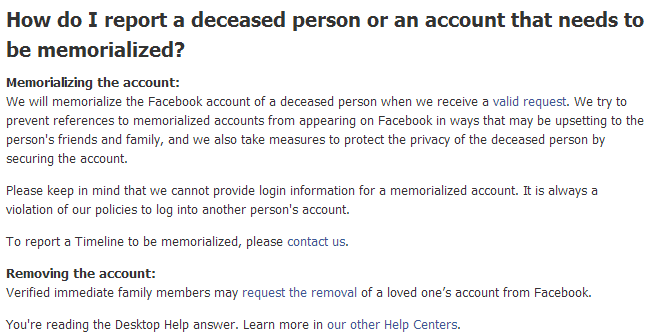 Wouldn’t it depressing if at one point half or more of the friends you had on Facebook are dead? Lets just say someone makes all their friends in their twenties and grows to be 90, unless that person is in the habit of making many new friends in their older years then most of their friends from the early 2000’s would probably be deceased. How will Facebook deal with this, will they convert these accounts into memorials, which are segregated from the friends list? Just a morbid thought I would like to throw out there to ponder upon, and I guess Facebook friends are the last of a persons worries when most of their REAL friends have passed on. Also, if Facebook follows the trend of every social media site before it, Facebook will have fallen out of popularity by the time our generation has gotten old. Everything in moderation – that includes viewing photos and news about your friends and uploading photos and news of yourself. 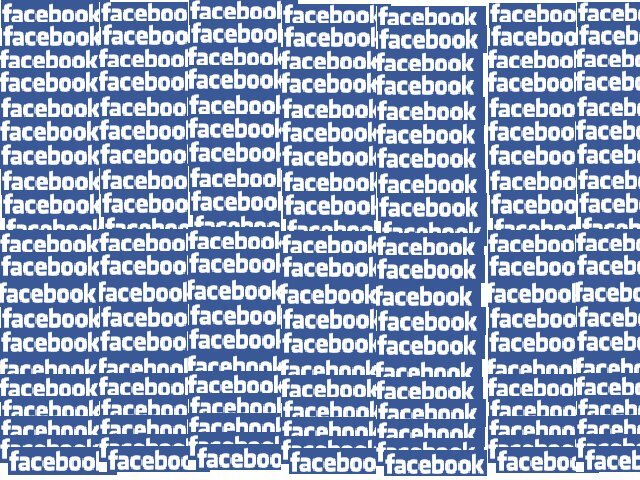 Of late I have come to realize that if a person spends on average 1 hour per day on a site like facebook starting at age 15 and lives until 90 (not an unreasonable life expectancy), then that person will have spent over three years non-stop on Facebook. Think about what can be accomplished in three years – a college degree, a three year prison term, etc. Facebook and online social media including the blog you are reading right now are sapping people of time that they would have otherwise hopefully used in a more productive way. This blog, while in my opinion better than Facebook in that it belongs to me, the ads are mine not Facebook’s and much of what I write requires research and learning, is still most likely going to take up at least a year of my life before I’m finished (literally and figuratively). In essense, what I’m trying to say is next time you want to ‘poke’ someone on Facebook consider driving over and phyiscally giving that person a poke (after considering the legal implications and of course the social acceptability of the action). Next time you decide to peruse someone’s photo album, take a moment and consider whether it’s worth it – perhaps the time would be better spent getting on the ground and doing 50 push-ups. Facebook will never tell you how many hours you have spent on the site, it would reduce popularity! Advertisements can utilize any information you put on Facebook, such as exact age, political party, music interest, religion, etc. in order to fool you into thinking they are specifically catered to you! All photos submitted to Facebook may be used by law enforcement, employers, news papers, etc. without your permission – the photos are no longer yours. Blackmail – Facebook rarely deletes your information, even if you change or delete it from your profile. Profiles are never deleted, they are only archived and put into hibernation until your revive it. Does Facebook Lead to Suicide? That’s what the Archbishop of the UK is saying. He claims that social networking sites are replacing real world relationships and making society lose its ability to build “interpersonal communication”. At first it sounds absurd that social networking sites will lead to suicide, but the more I think about it the more it makes sense. Less real relationships, more prone to superficial judgment, and lots of sad people looking for online friends. I could only imagine what it would be like to be someone on one of these sites, be it Facebook, Myspace, or even XiaoNei (the Chinese Facebook) and care about how many comments I get on my photos etc. Personally, I find social networking sites to be a tool to “add” people you get to know so you don’t forget them. However I do find their “apps” distracting and a waste of time. Thankfully, my premiere summer destination forbids Facebook so I an disinclined to visit there anyways. It was bound to happen someday. A London man killed his wife after they split up after finding out on Facebook that she not only changed her profile to “single” but also posted messages telling everyone she had left the man and was looking to meet other men. A day later, the man beat her, tore out clumps of her hair, and repeatedly stabbed her in the head and neck. Facebook, the most popular social networking site traditionally open only to college students/alumni/faculty is planning on going ahead revamping it’s design. Now you might be wondering why such a sucessful company would risk it all on such a bold venture? The answer is more simple than it seems, money. Money makes the world go round, as it is said. Now the ways Facebook will make money with it’s new layout are simple, more clicks to get where you need to go means more space to shower you with traditionally discrete ads. More ad views means more potential ad clicks, and more ad clicks means more money for the bottom line. Now there are quite a few members against this new idea, as there were quite a few members against letting Facebook open up to the public. However there is little doubt in my mind that the plan will proceed. What can you do? Traditionally we as Americans tend to think that Democracy is always the way, be it in government or the website we frequent ever so frequently. The truth is, there will be no popular vote, and in a few more weeks the “switch back to old facebook” link won’t be there any more. Now I know that this is sad news, and I know you have a lot to say about it, so please comment on this post and tell me what you think. To comment simply click the post title. In the past few years, researchers have concluded that based on polls and statistics, social drinkers earn more money than those who are not social drinkers. Let me clarify what a social drinker is, a social drinker is someone who will willingly involve oneself in the action of drinking socially, that is with other people. The statistics read that men who are social drinkers earn on average 10% more, and women earn on average 14% more. Now can we then believe that forcing ourselves to become a social drinker will earn us more money? It is my personal belief that the reason behind these findings is not the drinking aspect, but the networking aspect. Just imagine what opportunities arise from meeting new people in the same area can do for you, it can link you with potential business partners, employers, or perhaps improve your relationship with your boss. From the previous findings, I will hypothesize that those who use Facebook in a effective and efficient manner will consequentially earn at least 5 percent more than those who do not. The reason I am choosing Facebook here instead of Myspace etc. is that Myspace has a lot of junk that clutters my and perhaps others “user experience”. If you ever find any studied related to this, please comment.